What is Landscape Photography Magazine? 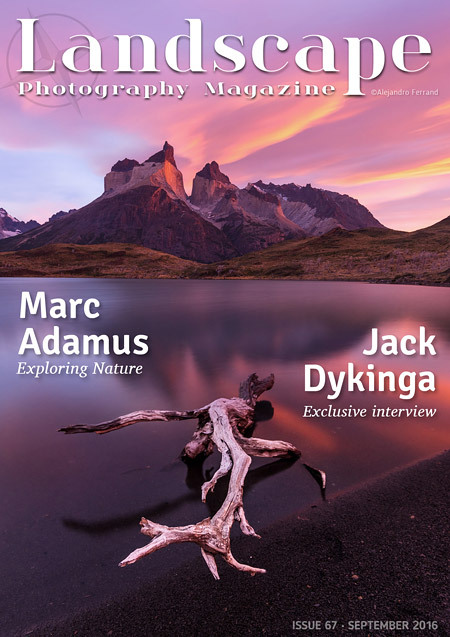 LPM is a highly acclaimed, monthly photographic title, which is leading the way in the Digital Magazine revolution and is dedicated to bringing you inspirational photography, educational articles, the latest news and gear tests, tutorials, location tips and much, much more. Every issue of LPM is packed with refreshing content, exciting features and stunning imagery from around the world – all provided by innovative professionals who share one passion – that of landscape photography. Not only we showcase the work of great landscape photographers, but also promote imagery from enthusiasts and new talents of all ages from around the world. LPM can be downloaded as a PDF file for offline reading at leisure on your computer, laptop, tablet and most mobile devices. Landscape Photography Magazine is proud to work with some of the very best photographers and authors in the world, ensuring that we provide our readers with exceptional content every single issue. The visual drama and artistry of his photographs are born of a keen eye for the many moods of nature and a life-long passion for the wilderness. Alister Benn is a full-time landscape photographer, author and guide. Having lived for over a decade in the Himalaya of Tibet and SW China, he now lives and works on the Isle of Skye with his wife Juanli Sun. Ian is a full time professional nature photographer, writer, and adventurer. His work has appeared in numerous magazines, books and calendars. Since 2008 Adam has been working as a full time pro landscape photographer, supplying imagery and undertaking commissions for a wide range of clients. Alain is a fine art landscape photographer, photographic workshops tutor and author of several books and eBooks. Mark is one of the UK’s leading landscape photographers with work published worldwide. He supplies several image libraries. Guy is a full time photographer, writer, and naturalist living and working in the Colorado Plateau, a scenic and diverse region of the western US. LPM brings you page after page of stunning images and original features from all around the world. Also, unique to Landscape Photography Magazine, our ‘Aperture’ and ‘Revelations’ features offer our readers the opportunity to share their travel experiences, opinions and thoughts. What a breath of fresh air to see a magazine devoted to landscape photography. Well done to all and keep up the good work. Really informative, professional looking and easy to read, definitely inspiring. I am only just getting in to photography stuff, so I have discovered LPM just in time! Congratulations. The magazine is gorgeous to look at and full of interesting and useful articles. It reminds me that my photography would benefit from learning and trying out new skills and techniques. At last!! A dedicated Landscape Photography magazine with the foresight to look for new talent and show a genuine appreciation of the beauty and emotion of Landscape Photography. Packed with great articles and inspiration. Well done everyone, keep up the great work and long may the magazine continue!